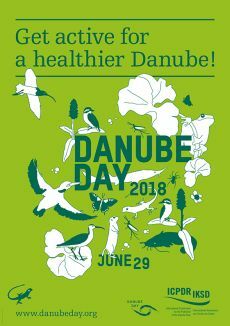 Get active for a healthier Danube in 30 cities across Serbia! Three months of celebration in 30 locations began in Belgrade and spread out to Bela Crkva, Stara Palanka, Veliko Gradište, Bačka Palanka, Novi Sad, Pancevo and Ćuprija! Enthusiasm for rivers was nurtured through workshops, boat trips, tree planting and regattas. saw children navigate between fun activities, learning about rivers along the way. Creative workshops fostered young people’s enthusiasm for their rivers. This festival of the Danube brought music, theatre, art, traditions and sport to the river and the street. Children enjoyed eco games and hands-on activities, including encounters with wildlife. Volunteers got active clearing riverside litter. Free lectures highlighted actions towards sustainable river management and explained how to get involved in protecting your river. A workshop on sediment transport by the Jaroslav Černi Water Institute encouraged children and adults to paint stones with messages of solidarity. Placing them in the river transformed them into 'water mail', sent out to the downstream countries. Read about the partnership of ministry, local authority, NGO and business responsible for the festivities on the website of the Ministry of Agriculture, Forestry and Water Management: Republic Directorate for Water. The event also awarded winners in the Danube Art Master contest. This annual 14-country art extravaganza tasks children to visit rivers and create an artwork from found materials or a video showcasing ideas for a healthier Danube. See the website of the Young Researchers of Serbia, national organisers, for more details. Two winners go on to the international final later this year. Among other highlights was the Great Belgrade Regatta. Taking place on a 50 km stretch of the Sava and Danube rivers, the 2-day international regatta attracted participants from across Europe. To see how all the countries celebrated in 2018, go to Review 2018. You can also revisit 15 years of Serbia's Danube Day via the general Review page. Milica Milenkovic of the Republic Directorate for Water: +381 11 201 33 56; Mobile: +381 60 0625 515; milica.milenkovic@minpolj.gov.rs. For news of Serbia's Danube Art Master contest, contact Dušica Trnavac Bogdanovic of the Young Researchers of Serbia on +381 11 311 66 63; mobile: +381 638 737 170; dusica@mis.org.rs.